The updates below are outdated, not recommended for downloading and unsupported as of Jan 29 2011. 2 new scenarios and many more other updates. Note: you must have the update 1.2 installed before applying this update. This update includes new units, objects as well as some vital fixes. Note: you must have the update 1.1 installed before applying this update. 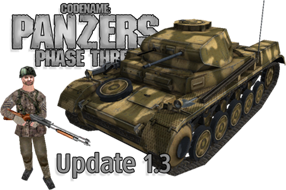 This update includes new units, buildings, objects as well as some vital fixes. Check out what's new in this version here. Note: you must have the version 1.0 installed before applying this update. Requirements Hardware requirements are the same as for the PANZERS Phase 2 (more info in the manual included in the installation). 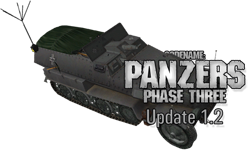 So the only requirement you need is PANZERS Phase 2 installed on your hard drive.